Become a Certified Cloud Professional through independent online cloud training and online examinations. 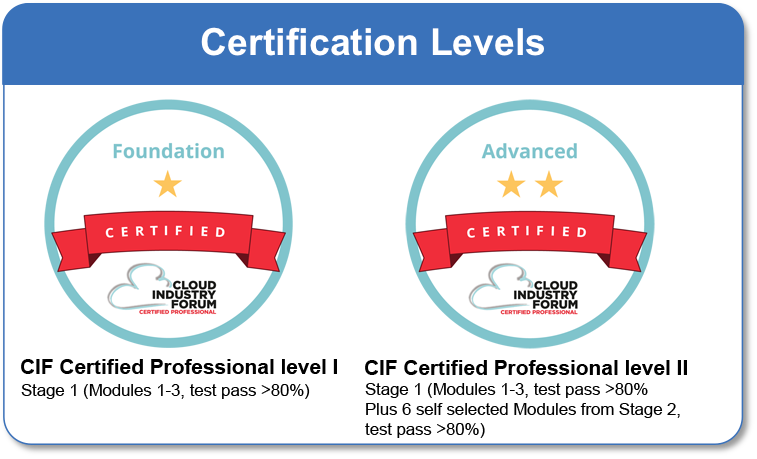 CIF Professional Certification can help you validate your cloud knowledge and expertise in this complex yet highly sort after field. CIF professional members are eligible to become certified by taking the online exams and achieving a score of 80% or above for each module taken. For more info on Professional membership click here. The certification exams are based on the course content contained in the online e-learning training modules. You can include this certification in your recognised qualifications list and add the CIF certified logo to your social media profiles. Based on the content contained in the CIF E-Learning courses (Online modules and supporting documents, resources). Cloud is now a mainstream technological approach to IT and most organisations are looking to leverage cloud platforms and services at a strategic level, yet risk and complexities mean the demand for professionals who are ‘in the know’ is at an all time high. Certifications and qualifications are often used to differentiate individuals from others in the market and help organisations remove some of the risk from the recruitment or staffing process. The online course material covers research & strategy and assessment & planning for cloud adoption. The course material is independent of any vendor or service provider. The curriculum has been designed to help organisations accelerate and de-risk their cloud adoption projects by identifying key issues and principals for the strategic and tactical planning stages of the cloud adoption roadmap. Certified professionals can demonstrate that they have learned and understand these principals and can positively support or shape cloud projects.